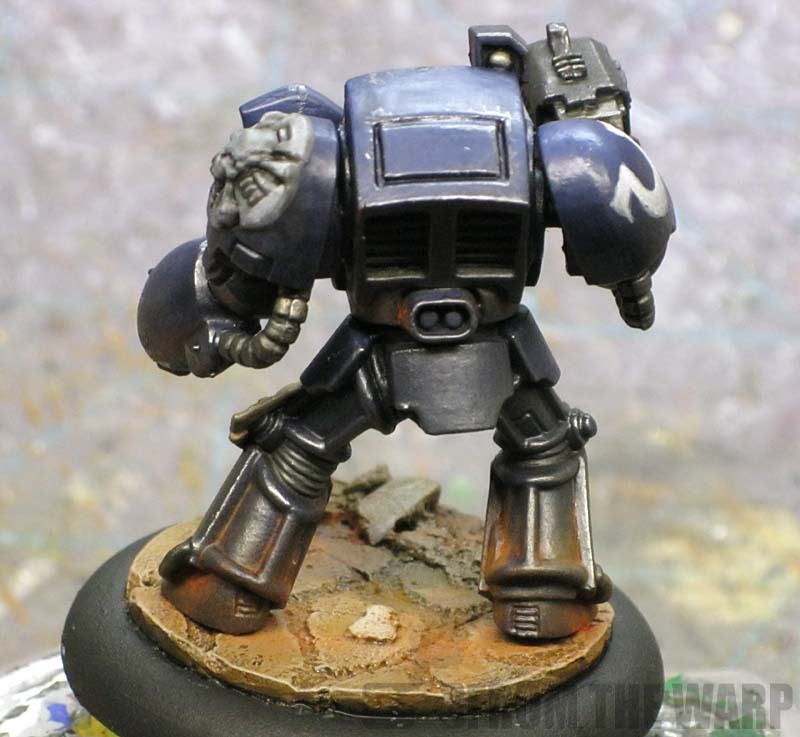 Ultramarines are the iconic Space Marine chapter out there. Like most other colors and armies, there are a million different formulas for painting them as well. Fortunately, blue is one of those colors that is fairly easy to get nice results with. In this case, I wanted somethign dark and fast. Very fast. I wanted this guy to be done in no time at all and still look decent in the end. This is what I came up with. The idea for this technique comes from my previous post where I went over painting Eldar Dire Avengers. And that's about where the similarities end. When it came to this guy, I wanted to do even less work on the model. The model started out primed black. I gave it a quick spray. If I were doing it a better, I would have gone back and touched up the areas that needed it with black paint from a pot. In this case, I didn't because this is more of a test model to see if the idea would even work. Once I had him primed black, I figured it was simply too much work to paint his armour blue. I decided to spray paint it on. Then I realized if I spray painted the blue on, I'd need to go back in and add the shading. Not wanting to do that, I thought I'd try a zenithal approach to spray painting the base color. I'd spray from the top down with a couple of short bursts and call it a day. I tried it on two models before getting something I figured would work. The model on the right has too much blue for my liking. I fixed that on the model on the left by not spraying as much. This leaves me some more black on the lower portions of the model. Now we're talking, instant basecoat with shading and highlighting. After I had him basecoated, I gave him two quick, undiluted washes of GW Asurmen Blue to tone down my blue basecolor, blend it into the black areas and add some shading to the recessed areas where the wash collected. From this point on, I cut in with black paint on the areas that were going to be metallic or black in the end. 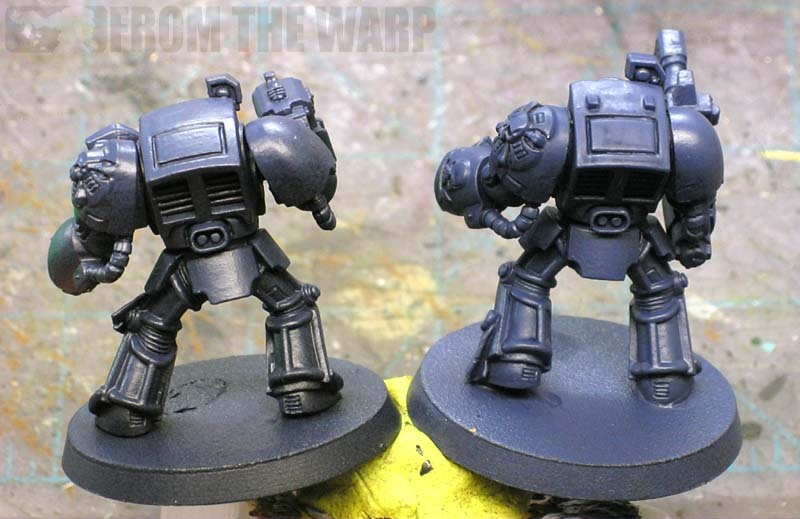 The metal areas were given a coat of GW Boltgun Metal and then washed with GW Badab Black. The most work went into his helmet and chest eagle. I did them quick here to get the contrast. 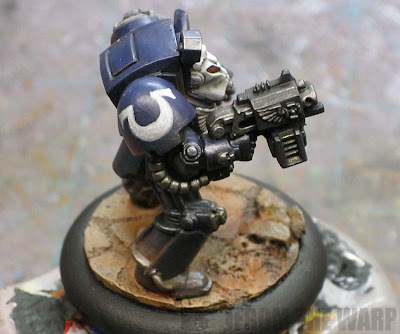 On a real model, I'd tighten up my brush work and use a layering approach so it was cleaner in the end. As far as painting goes though, it's just three laters of dark grey, light grey and then white for effect. Here's where he comes to life. Between the brown and red powders to tie him to his base, I added some metallic powder along with a pencil and scrubbed along the prominent edges of his armour to add some wear and tear. I've talked about pencil weathering and metallic powder weathering before. They're (powders and a pencil) fast and terribly effective in getting the look I enjoy on my models. As far as fixing weathering powders, that's another whole issue if you'll be using this approach you'll need to work through. So what colors did I use to paint the model? As far as exact colors of spray paint, I went with the cheapest black I could find (Flat Black by ColorPlace) and then the blue is Oxford Blue by Krylon. I got them both from Walmart. The blue is a satin color, but that's not an issue since the model is washed twice with Asurmen Blue and is flat by the time both washes dry. You could use other colors and get the same effect. 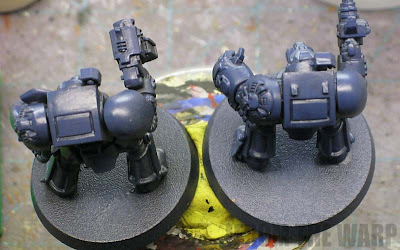 It wil take some testing on a model to make sure you like the colors you have and that you get the correct amount of color over the black primer. Understanding the basics behind zenithal highlighting is important too. In the end, I think the biggest thing to take from this is that you don't have to invest hundreds of hours into a model to get it good looking or tabletop quality. 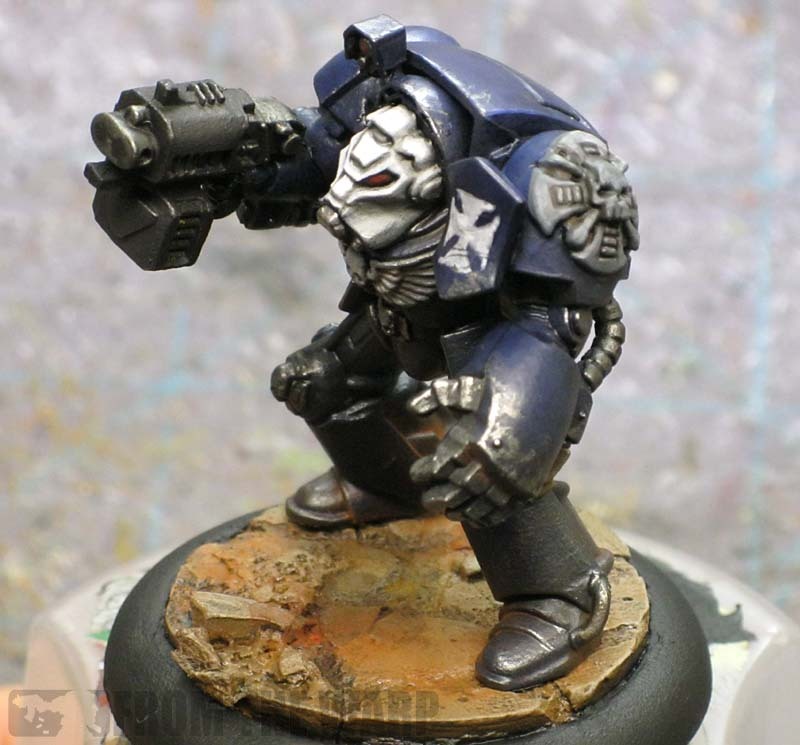 Here's another way to paint Ultramarines. It produces a much cleaner look in the end, but still doesn't take a ton of time to do. The trick is keeping at it until you find the method you like that gets the results you want. The you keep at it until you refine it down to it's basics and make it your own. Sweet technique, there's no excuse now for people to field a space marine army clad in "plastic gray." I agree with Kynikos, all you have to do is make it look good from 6ft! You're not wrong with Blue being so much easier to paint, Ron and this guide really highlights this. You've given me some food for thought about how I approach Dark Angels in the future, as I'm not happy with how my current batch have turned out. Good technique for quick armies. Kynikos: True... at least for Ultramarines. Other colors might be tougher to do or require a different approach though. Fayte: From assembled model with no paint or primer to completely done: Maybe 45 minutes (including time for the washes to dry completely). You could do a squad like this in no time. Sendraks: I could see this working for Dark Angels. You'd just need to find the right shade of green to start with. You've been great about posting tons of new content, but...any news on the Blog-Rolls coming back? Mr.Esty: Not at this point. I've found a way to run the entire list through Feedburner, but there are two larger problems in addition to some smaller issues. 1. It does not update immediately. There is a delay of up to a half hour sometimes with updating. 2. The only thing in the rolls are post headlines and a snippet. No thumbnails. I'm open to suggestions as I've seen other folks now experiencing problems with their blogger blog rolls as well. Personally I would have added a bit more Blue but hey to each their own. Man Boy Genius: Thanks! I'm really starting to get into it myself. Kevin: It comes down to a personal taste. I'd say to try it out with more blue to see if it fits your liking. That's part of posting this stuff... for you all to take it and make it your own. So I was wondering, do you think this technique would work over something besides black? Or does the black shadows hide some of the imperfections? Because I was thinking of doing a ligher grey spray over Adeptus Battlegrey. Issac: I think this would work, you just might have to give it a wash to add some shading to the recessed areas. 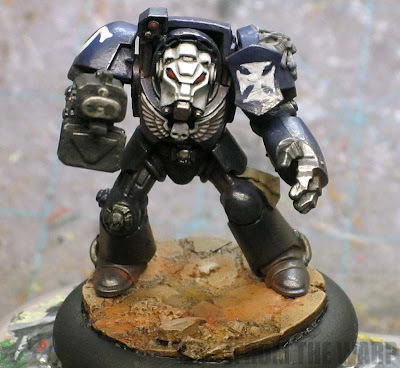 I was thinking about trying this with a light grey and white to get a nice shaded white armour. Then throw a wash over the recessed areas for effect. In the end, a little experimenting and you should be able to come up with something workable. R. C. Fountain: Excellent! I'm glad it worked out so well for you. I'm a huge fan of this approach. I love the way it draws the eye to the more interesting parts of the model. Great stuff. Thanks for putting up such a kicka** blog too! Your posts are always interesting and helpful! I did something like this when i got Black Reach. But a litte tip is to look at some of the Army Painters product. And now when AP warpaint will be out in next month, you can get paints same colours as the sprays. Steve: Thanks for the kind words! Per H: Very true... with careful priming and basecoating, you can get a lot done on a model. An airbrush allows for even more control too. 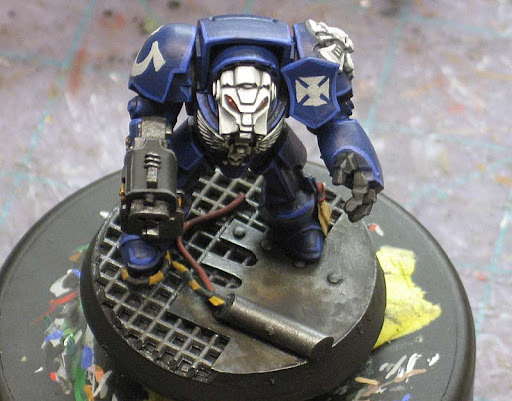 Like you mentioned though, brush work is a very important part of all of this as it finishes off the model in the end.